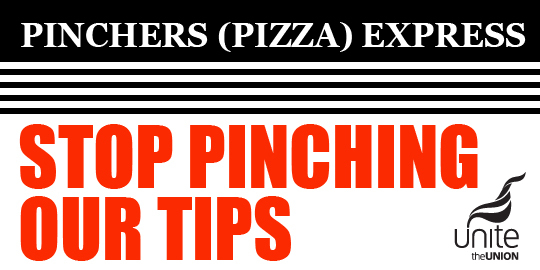 Unite has launched a campaign to get Pizza Express to scrap the 8% admin fee it deducts from credit card tips. This meant waiting staff lost £1m last year. We say that the only fair tips policy is one where staff get 100% of customer tips. We’ve taken action in London with a big protest outside the chain’s flagship restaurant but we now need to take the campaign to high streets across the UK. This is where community can help. Can you think of any Community branches/members who would be willing to take action in support of Pizza Express workers? It’s fun, simple and winnable! We can send you supplies of the materials – attached (including flyers / postcards / placards) with a step by step guide to get their local actions started. Pizza Express has over 400 restaurants on high streets across the UK, so it shouldn’t be hard to find one. The aim is to build up the campaign over the summer, ending with the ‘meal of justice’. Could the community branches or regions pay for a couple of our members to have a meal – stand up after once they get the Bill and talk to the other customers about some of their tips going to Pizza Express management and not the staff. To get more info or the materials contact Chanty. Briefly –timeline is flexible, more detail can be found in the attached recipe card. 1. Find a local Pizza Express restaurant /restaurants to focus the campaign on. 2. Week 1: Talk to Pizza Express staff about Unite and the campaign. Tell them about what Unite is doing to get the tip tax scrapped / Hand out the workers’ flyer) / Week 2 – pay a follow-up visit to staff. 3. Week 3: Hold a short, hour long at most protest outside your Pizza Express restaurant(s). 4. Week 4: Meal of Justice – enjoy a pizza with your team! Now stand up and tell the other customers that you are tipping in cash because you object to PE’s 8% admin fee. Activists will be encouraged to get active on social media. Taking pictures and film of their actions (protest and meal of justice) and sharing Unite’s digital content, petition, survey and other shareable content.